The U.S. Postal Service considers mail to be delayed when it is not processed in time to meet its established delivery day. Delayed mail can adversely affect Postal Service customers and harm the organization’s brand. We used our risk model to identify processing facilities with high volumes of delayed mail. From April to September 2016, delayed mail volume at the Santa Clarita, CA, Processing and Distribution Center (P&DC) increased by more than 34 million pieces (or 264 percent) compared to the same period last year while national delayed mail volume decreased by 75 percent. The Santa Clarita P&DC is responsible for the Postal Automated Redirection System (PARS) mail for Southern California. PARS is an automated process that redirects mail because of insufficient postage, a change of address or because the mail cannot be delivered due to an incomplete or incorrect address. 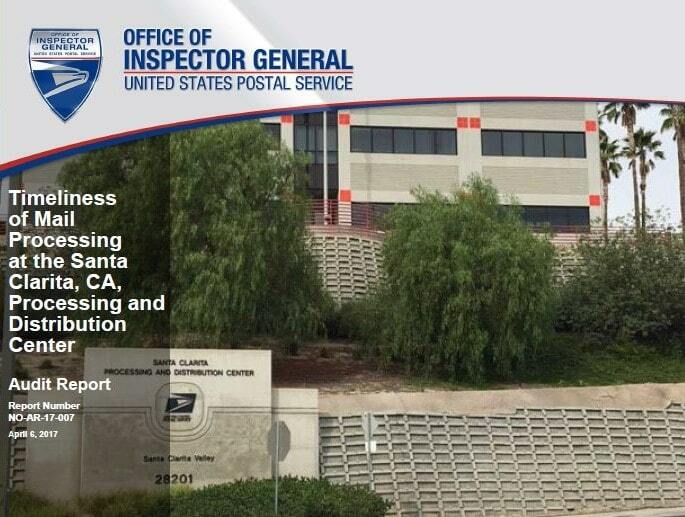 Of the 47 million delayed mailpieces at the Santa Clarita P&DC from April to September 2016, 27 million were PARS mail, 19 million were letters and flats, and 839,000 were packages. Our objective was to determine the cause of delayed mail at the Santa Clarita P&DC. PARS and letter mail was delayed because the Santa Clarita P&DC did not have enough staff to operate mail processing machines and delivery unit employees did not follow PARS mail preparation procedures. Additionally, we found that packages were delayed or sent to another facility for processing because of insufficient machine processing capacity. In January 2016, PARS mail processing operations moved from the Industry, CA, P&DC to the Santa Clarita P&DC with 24 full-time equivalent (FTE) positions instead of the requested 64 FTE positions (or 63 percent fewer). Management said they were in the process of filling the open PARS positions. During our site visit in October 2016, we observed that, because of insufficient staff, up to 12 employees on each shift routinely split their workhours between operating PARS mail processing machines and working in another mail processing operation. This caused the PARS machines to be idle for a portion of these shifts. Furthermore, employees at the almost 300 delivery units served by the Santa Clarita P&DC did not always follow PARS mail preparation procedures when sending mail to the P&DC. For example, they did not properly label trays containing PARS mail or correctly identify PARS mail trays by category. As a result, P&DC personnel had to manually sort PARS mail so it could be processed for delivery. 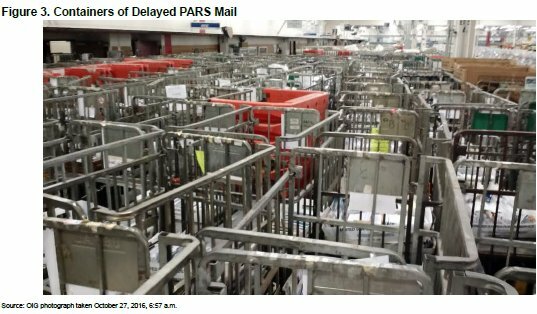 During our site visit, there was a processing backlog of up to 4 days, with an average of about 995,000 pieces of PARS-delayed mail per day. We discussed the backlog and the incorrect PARS mail preparation with P&DC management. Management subsequently took corrective action to ensure the delivery units used the PARS mail preparation procedures before sending the mail to the P&DC. The Santa Clarita P&DC did not have sufficient machine capacity for packages. Management said the P&DC operated the package processing machines for more hours than planned to ensure mail scheduled for delivery the next day was processed. As a result, there was not enough time to complete scheduled preventive maintenance. In addition, we observed the Santa Clarita P&DC sending up to four trailers of packages a day to the Los Angeles International Service Center for processing. Management said the P&DC is supposed to receive an additional package processing machine once they move PARS operations to the Pasadena P&DC in March 2017. We did not assess these changes and plan to evaluate them in future audit work. 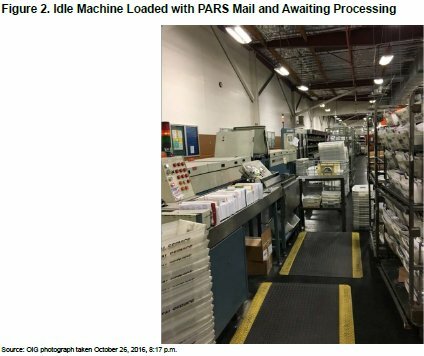 PARS mail preparation and staffing issues and the insufficient machine capacity for packages from April to September 2016 resulted in about 29,000 more overtime hours than budgeted, at a cost of over $1 million. Management said they used the additional overtime workhours to keep staff after their shifts to process PARS mail and sort packages. When mail processing facilities do not have sufficient staffing and machine capacity and delivery unit employees do not follow established procedures, there is an increased risk of delayed mail and overtime. In addition to the added costs of overtime, delayed mail could cause customers to move to alternative service providers, which would reduce revenue. We recommended that Postal Service management ensure an adequate balance of PARS mail workload and staff to prevent delayed mail and overtime. We also recommended management ensure delivery units comply with PARS mail preparation procedures. Finally, we recommended that management develop a 2-5 year package processing plan to ensure processing capacity and staffing are adequate to support current and future package volume growth; in the interim, continue to redirect packages to facilities with excess processing capacity where possible; and ensure preventive maintenance is performed within established parameters. This entry was posted in Downsizing USPS, General Union Business and tagged delayed mail, inadequate staffing, PARS, Postal Automated Redirection System, preventive maintenance, Santa Clarita P&DC, usps mismanagement, USPS OIG Audit Report. Bookmark the permalink.